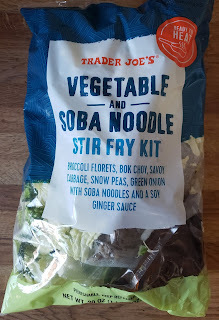 Warning: a completely predictable review of Trader Joe's Vegetable and Soba Noodle Stir Fry Kit is about to start. Read on at your own risk of spending the next three to five minutes of your life knowing exactly what's gonna be said here. First, I'm gonna say something about kids and being busy because of kids and work and stuff and life and whatever else that having the time to actually cook a dinner is a rare treat, because when we're not busy we're actually somewhat aware of how tired we are. Because of this, we rely a bit too much on boxed mac n cheese and other super quick meals. But we also want to be vaguely healthy. 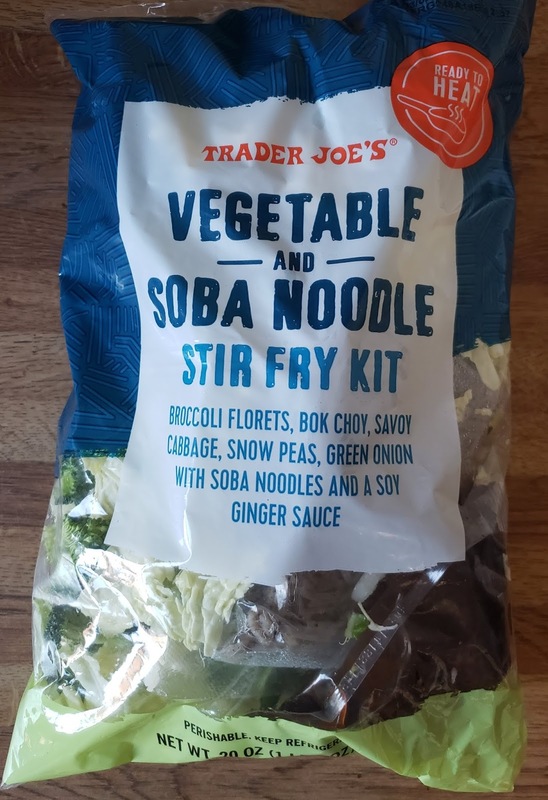 So next then is the suggestion to purchase said TJ's soba noodle stir fry kit to give it a try. It features many fine leafy green veggies, which are good for you. Broccoli is good and tasty. So is bok choy, or at least I guess so, because we consume it without much argument (us adults, at least). And everyone likes snow peas, and cabbage, well...it works. Good veggies. Firm. Fresh. Crisp. Yum. Then the point will be made that the soba noodles are also quite good, in the way that only soba noodles can be. A side note regarding relative lack of experience of consuming soba noodles will be made, because restaurants like that aren't in the family wheelhouse because, well, kids. Though they should be. But whatever. Noodles are good, with good veggies. And then good sauce. Soy and ginger. There's nothing magic about the combo but dang it's good and a little bit spicy. That sauce really ties it all together, doesn't it? It doesn't matter what anything else is - there could be cardboard strips or mulch in here, but if there's a good tasty sauce on it, it'll taste good. Then the familiar complaints that some may make: Might be too salty for some. That's true. Soy sauce is super salty. It can't help itself. Then at $4.99 it might be a bit expensive compared to making similar sized servings. That's probably also true but discounts the notion that convenience and ease come at a premium. And then I will note that our kids hated it because it wasn't mac and cheese, mostly because it had an actual flavor, and were relieved when Sandy I offered to take their portions and feed them peanut butter banana sandwiches instead because we were hungry and not in a mood to argue with them. And I will the small quibble that it could use some protein - some chicken or heck even tofu would be a good side, but a little excess sauce would be super appreciated then. See? You could have guessed all that, right? Right. You're smart. 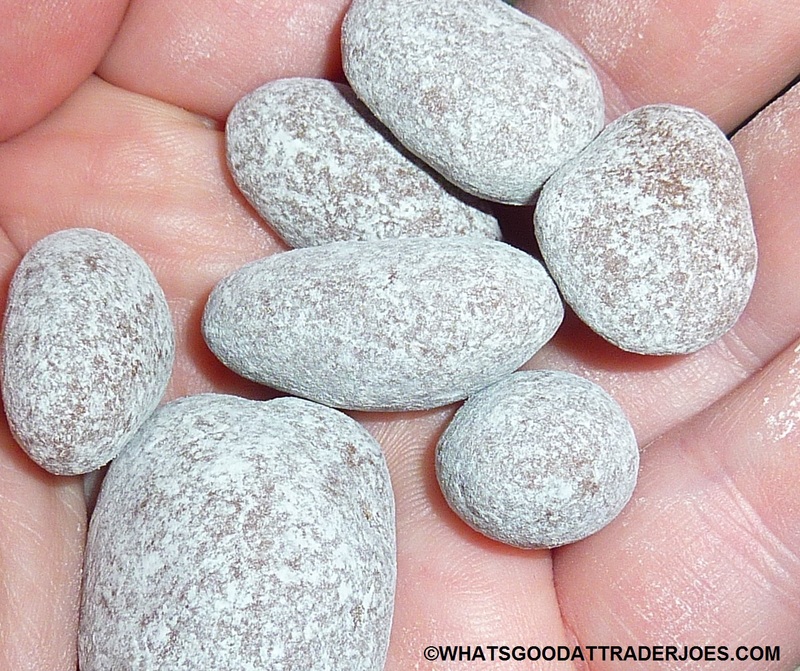 That's why you shop at TJ's, and why you read our blog. 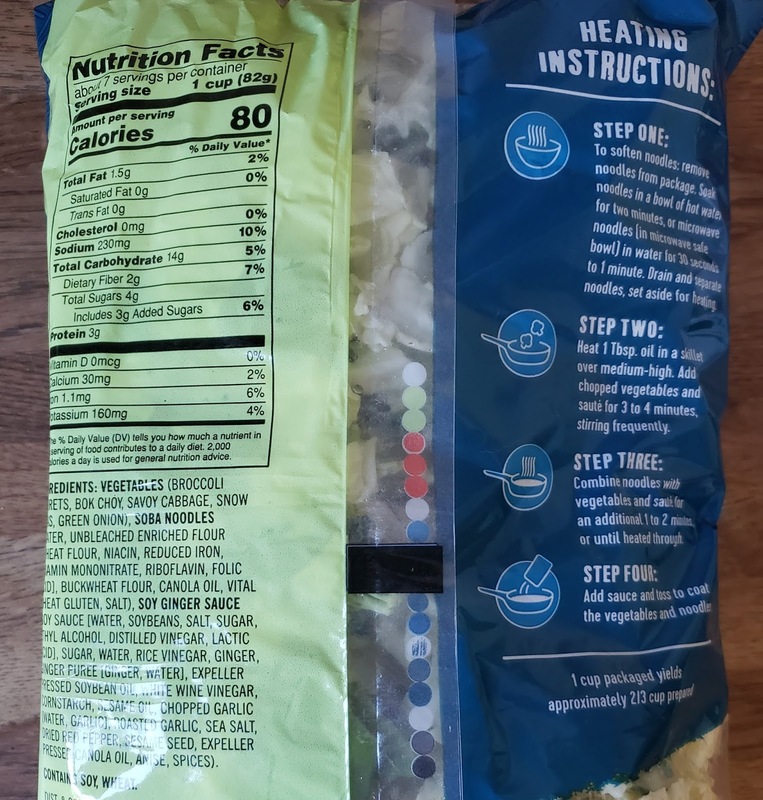 That's also why you'll follow our recommendation to check out the refrigerated section and pick up this TJ's stir fry kit the next time you go shop. Because we told you to, and you knew we would. 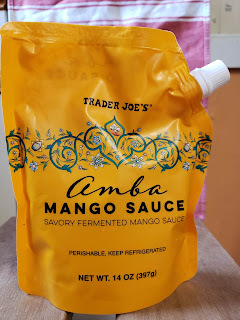 I mentioned a few posts ago that Lemon Lunacy should be added to Mango Mania and Coffeepalooza as another seasonal Trader Joe's flavor extravaganza. Well, on that same note, I guess Toffeepalooza wouldn't be a bad idea either. We're going on 8 or 9 product reviews with the word "toffee" displayed prominently in the title of the product, and a number of others where toffee ingredients or flavors were featured noticeably in the offering but failed to make top billing for one reason or another. So when I heard about these morsels, it made me wonder why we needed one more toffee-based candy on the shelves of Trader Joe's. Despite its newfangledness and potential buzzworthiness, I might have even passed over it entirely. However, Sonia snagged a bag on her latest TJ's shopping adventure at our old stomping grounds right in the heart of Hollyweird, California. She was no doubt influenced by the simple, eye-catching honeycomb pattern and stylish font on the bag. Graphic designers are so easily swayed by attractive package design. <sigh> Just because it looks good doesn't mean it is good. Case in point: that "glamorous" Oscars show some of you might have watched the other night is filmed right in the middle of a giant perpetual freak show...and it hasn't gotten any less bizarre since we lived there. But Sonia's instincts were right again. Unlike Hollyweird, this product lives up to its chic veneer. 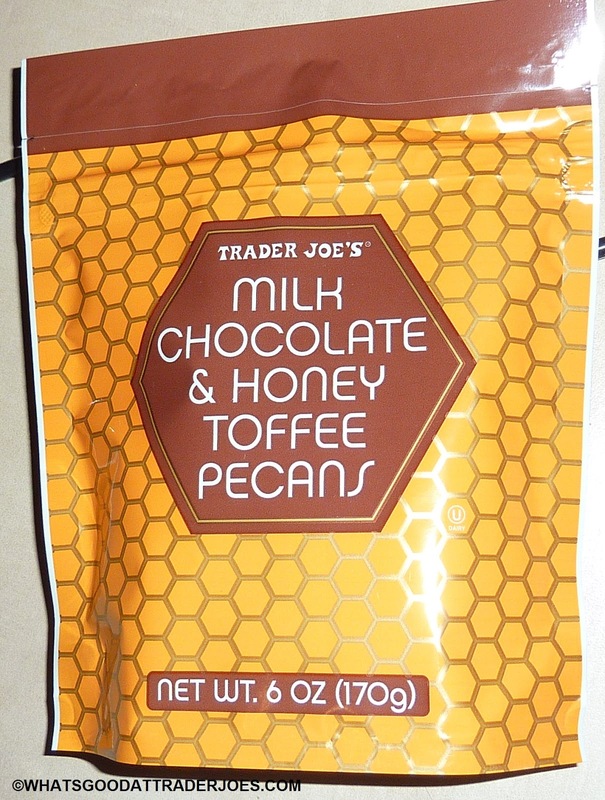 Upon opening the bag, there's a delightful chocolatey smell that wafts out from the package, with hints of the titular honey and toffee as well. 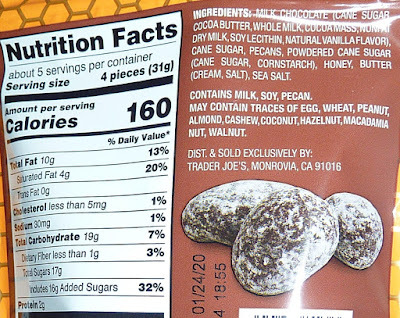 The candies are markedly larger than most pecan nuts, ostensibly because they're coated in so much chocolate and toffee. Most pieces are perfectly bite-sized, but the largest ones are surprisingly grandiose, resembling palm-sized stones, rather than mere pebbles—easily big enough for multiple bites. The taste is exactly like the smell: full of sweet milk chocolate, honey, and toffee, but with plenty of nutty pecan flavor, too. They're crunchy by virtue of the nuts and toffee, but not unpleasantly hard or brittle. Honestly, they're addictive. 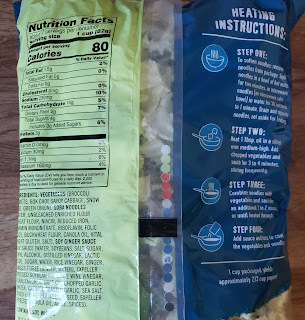 There's a resealable zipper at the top of the bag, but if you break this bad boy open in a group of four or more people, there's a good chance you'll never get to use it. If the title sounds appealing to you and you're a fan of all the constituent ingredients, I can't imagine you'll be too disappointed by this product. Toffee and chocolate aren't really my snacks of choice, but I was once again pleasantly surprised. Double fours once more. If a tree falls in the forest but no one hears it, does it make a sound? What came first, reality TV infamy or the Kardashians? All of these are unanswerable questions. Meditate on them night and day, and just maybe you'll have an answer...but all of these are timeless mysteries for a reason. What is watermelon, though, without water? ...or as of about right now you can head down to everyone here's favorite grocery shop, plop down $3.69, and buy yourself a bag of Trader Joe's Organic Watermelon Jerky. That's right. Watermelon. In jerky form. As in a famously watery fruit, highly sought after for its thirstquenching glory, dried and flattened and rolled up so as to eliminate any trace of a drop of some high quality H2O. It's odd stuff, for sure. It's unquestionably a very concentrated watermelon flavor, as one might expect. It's not as intense as I anticipated, but I'm glad TJ's didn't go the added sugars route. It's just watermelon sans water. Wow! If I'm doing my math right, the end product is about 1/34th its original weight, and is about three quarts of water extracted. Watermelon was hitting that Lasix hard. All well and good, but what about the texture? How does it actually work? 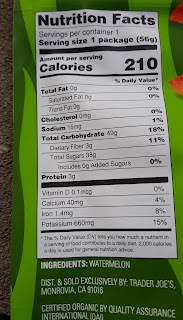 The melon jerky is kinda stiff, fibrous, and a little sticky. Both bags I have opened thus far have had all the pieces clumped all together necessitating them to be plied apart carefully. I lack any better way to explain it than saying, imagine a thin, dense sponge that got baked dry. That probably sounds more awful then I intend it you, but there's a surprising amount of chew to it. It's not as much as a jerky from a regular source, but still. 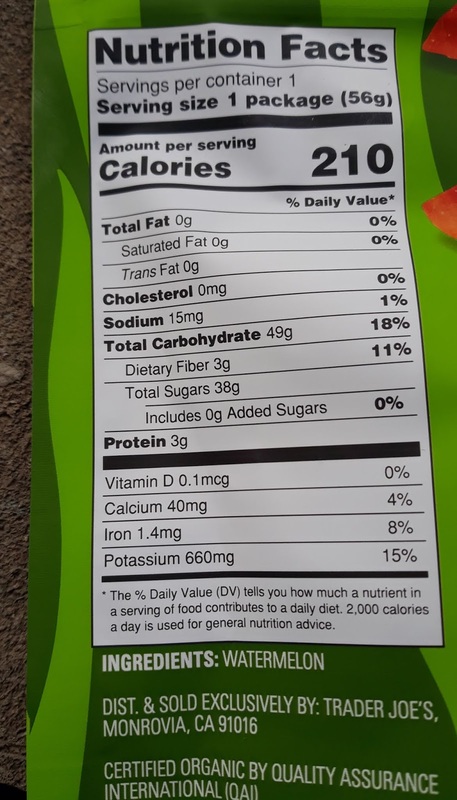 There's not too many seeds in the jerky either - I think I've seen maybe only two or three per bag, and they meld in well enough with the rest of the product. 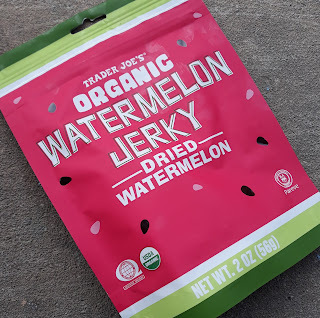 When all said and done, though, I'm not sure how much I actually truly like the watermelon jerky. There's an absolute novelty factor at work, which hit me with some initial marvel, but once it wore off, I was just eating weirdly dry waterlessmelon. 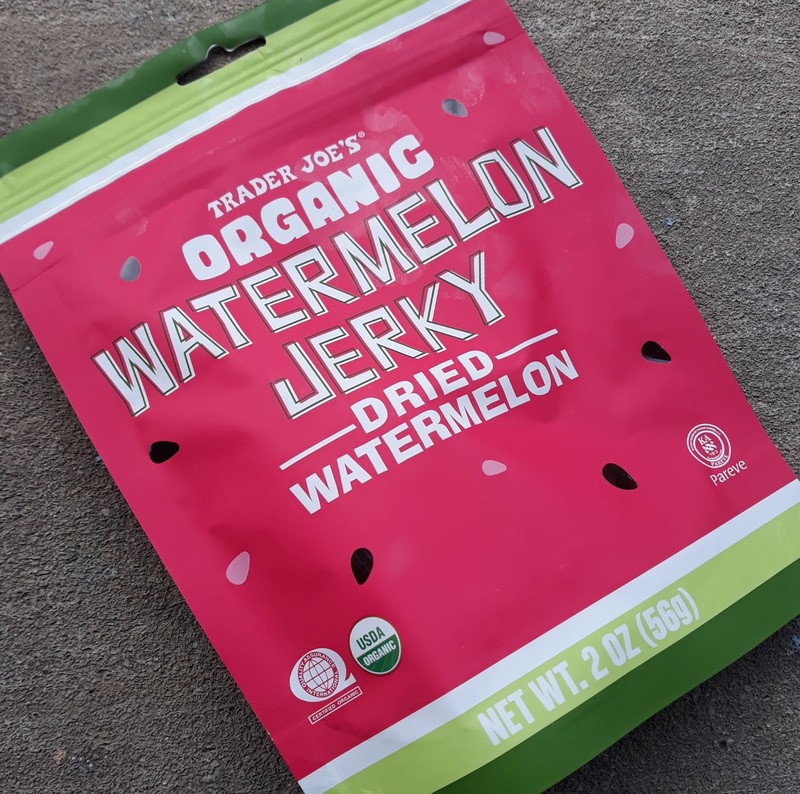 I've heard it said that watermelon jerky could be considered a vegan alternative to regular jerky - well, if that's your thing, go for it, but that's a bit of a stretch to me. I brought some into work to share, and most reviews were pretty friendly. The melon jerky definitely made for some odd reactions and some flatout rejections...but most were positive. 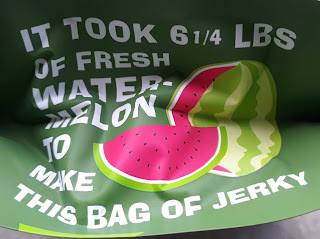 My final call is, if you like watermelon and novel snackage, the jerky is worth at least one try. Worst comes to worst, you can do TJ's no-hassle return policy - but I doubt it'd come to that. I don't know...double fours? That's as much juice as I can squeeze here for these edible contradictions. 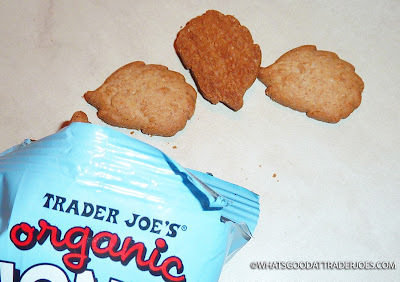 then reach for a piece of Trader Joe's Organic Watermelon Jerky! 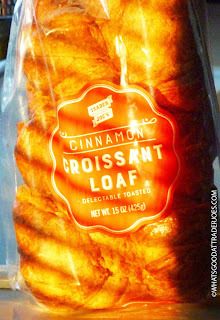 What I meant to say is: "then reach for Trader Joe's Cinnamon Croissant Loaf!" It's apparently the illegitimate lovechild of one stupid, steamy night between a loaf of frisky cinnamon bread and a sultry croissant. I don't want to get into the logistics of that whole thing, nor do I want to be too judgy...but just suffice it to say that it's a beautiful mistake—a happy accident, if you will. On its own, the bread is nothing to write home about. 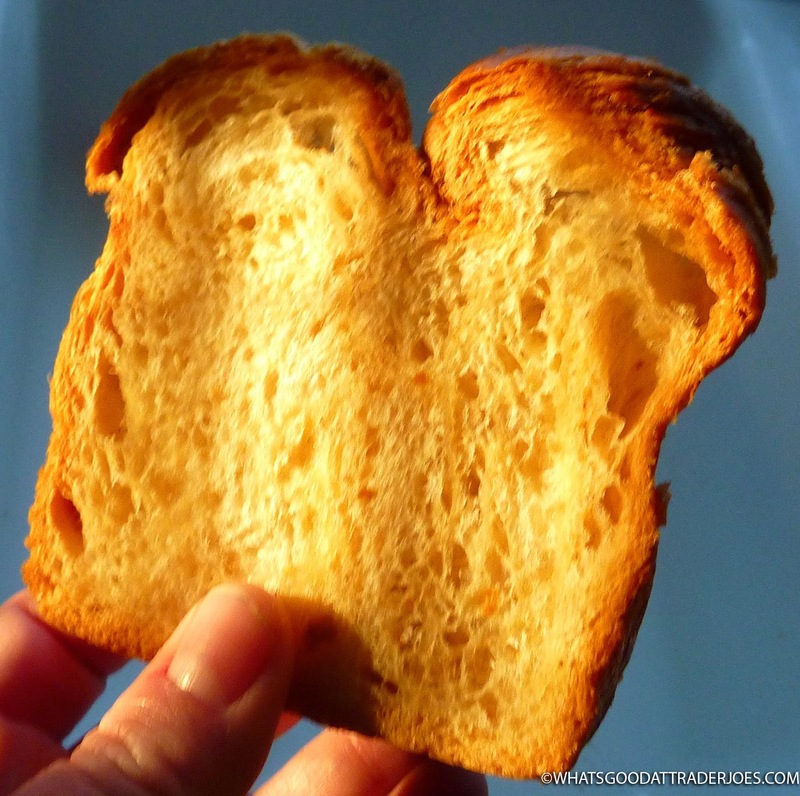 It's croissant-ish, but wants to be warmed up even more than a traditional croissant. There's some cinnamon flavor, but it's not overbearing, and it's not really sweet, either. Also, it's just not quite flaky enough straight out of the bag. Toasted with butter, on the other hand, this product is simply scrumptious. 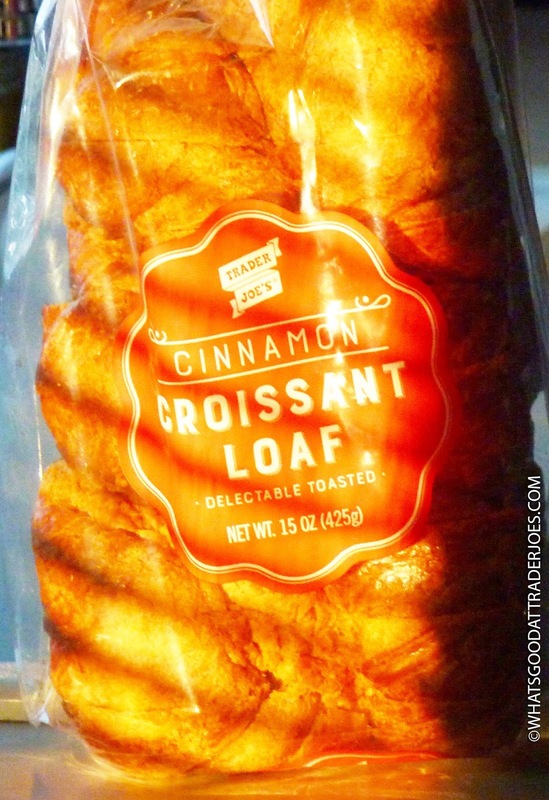 It's all the deliciousness of a croissant with all the convenience of sliced bread. The melt-in-your-mouth factor increases exponentially when toasted or warmed, as well. It's still not really sweet on its own, so just sprinkle a little extra sugar on top for killer cinnamon toast. We read online that people were making French toast from this stuff. I twisted Sonia's arm into making some for me since French toast is above my pay-grade as far as culinary endeavors are concerned. It was worth every ounce of effort Sonia put into it. Simply delish with some nice sweet syrup. Hey, I did my part, too. I made sure the dogs didn't eat any when the wifey put the finished product on the table. Let's see: they've done cinnamon croissant bread and pancake bread so far. What's next? Waffle bread? Bacon and eggs bread? Cereal bread? Those zany product developers always keep us on our toes. 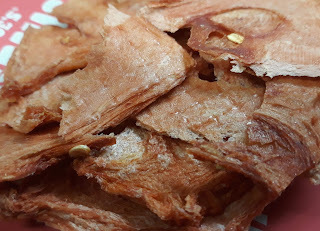 a very thin, light, crisp, sweet cookie or cracker, especially one of a kind eaten with ice cream. 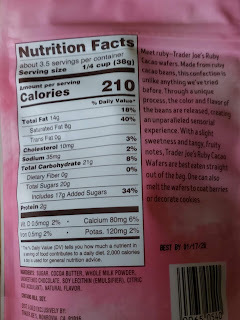 So imagine my surprise then, when opening a bag of Trader Joe's Ruby Cacao Wafers, that I did not see any wafers any where. None. 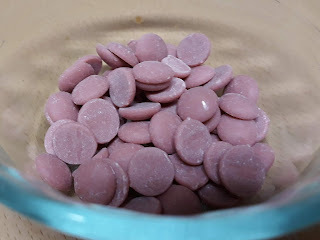 What I see instead: all these little roundish flat purply brown rose colored morsels that looked like a nonpointy ill chocolate chip or a baby candy melt. No cookie. No crispy stuff. Nothing waferesque at all. Just these little pebbles that would look at home in an aquarium. I was sold a sack of lies. 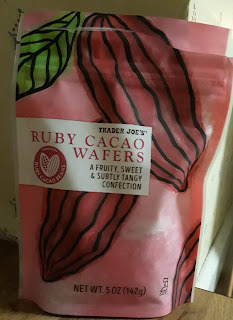 Fortunately, whatever you may call them, these TJ's ruby cacao thingermabobs are actually pretty tasty. Wow. Unique. I'm still struggling to come up with the right descriptors. Obviously, there's a healthy chocolate element, definitely towards the darker, deeper end. Yet there's so much sweetness - not even like from a chocolate covered berry, except similar. It's just not as potent, yet fruity in a different way. 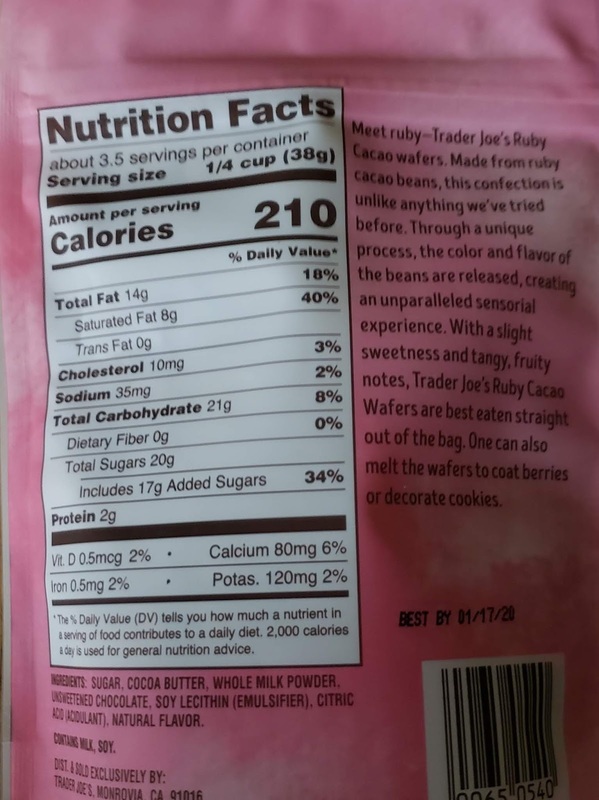 I checked the ingredients to see if any fruit flavors added - nope. Apparently it's what the beans taste like, and best I can tell you is, try some for yourself if you haven't already. The morsels are soft, softer than most chocolate chips and closer to the aforementioned candy melts, except not as chalky. Speaking of melts, the cacao bits seem to do a good job of that - pop some in your mouth but keep 'em there for a few to let the taste come alive a little and wash all over. I also nuked a few and they melted right on up without much fuss. I suppose they could be used to dip all sorts of stuff in if that's your thing. Sandy's not overly impressed. She had a couple then opted for a cookie for her night time treat, as did our daughters. I had a few small handfuls to try and get a better sense - I'd use the word interesting or intriguing more than delicious for them. They're kinda odd, but in a good way...probably. I dunno, try them for your self, kids. Middle scores here because we don't know what else to do, the only thing we're not wavering on is these aren't wafers. Period. Who wrote the rule book that says bite-size little fried dealies have to be served before the main course of a meal? Why do salads have to be eaten before the main course? Why dessert after? Just to spit in the face of such tyrannical traditions, I've eaten appetizers as the main course of my meal as often as I have had the opportunity to do so. I've also eaten desserts first and salads last...because I'm a rebel like that. I've upset many a waitress pulling such stunts, which, incidentally, is why I don't eat out very often anymore. Except Cracker Barrel. We eat there a lot...because they let us stay overnight in their parking lot. And even then we don't eat in the restaurant, but we get take-out and we eat at the dinette in the RV, where I'm not likely to upset our server with my unorthodox dining practices like consuming those tasty biscuits at the end of the meal rather than the beginning. All that to say: it just goes to show you how woke TJ's is—they specify on the side of the box that this extremely appetizer-esque product can be served "as a light entree." Right on. Free the app. Free the app from its predetermined role on the dinner table. Let it be whatever it wants to be. Free your mind first. Then free the app. So free the app we did when we had these as our main course for dinner the other night. They're basically crispy little egg rolls, but served in a different configuration. 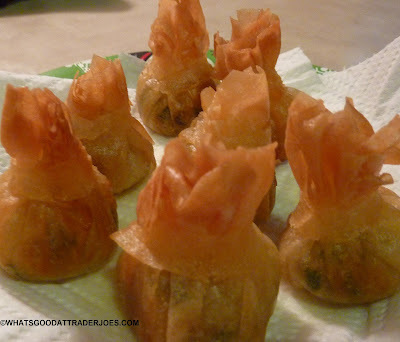 They contain many of the same ingredients as a typical egg roll, all rolled up into a mini pouch-shaped wonton, with a funky little flower-like bundle at the top. The veggies have a nice flavor, with plenty of oomph from the spice blend, which includes garlic, ginger, and salt. They might even be a little too salty with the soy sauce already added to the vegetables. That was Sonia's main complaint: there was no dipping sauce included. I wish they'd have refrained from adding soy sauce to the product itself and left a little packet on the side. Yes, yes, I know...more packaging is bad for the environment. But at least we could have administered the amount of soy sauce of our own choosing. These probably would have been killer with a bit of sweet chili sauce, too. There's not quite enough in the package to serve as the main course for two people. 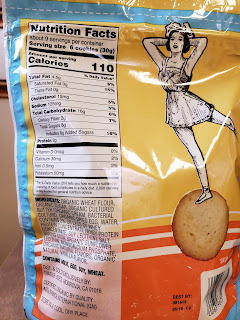 It says there are 2.5 servings in there, but that's if they're acting as an appetizer, methinks. I probably could have polished off the whole pack myself. We ate it with a little leftover catfish from Cracker Barrel, and that worked out nicely. Southern-Asian fusion isn't a thing as far as I know, but perhaps it should be. Sonia gives these vegetable pouches four stars. I give 'em three and a half. The word "neapolitan" means to be "of the city of Naples". Simple enough. Though to be honest, I always that it was neopolitan, not neapolitan...did this change at some point of time without any of us knowing? Is this another Berenstein/Berenstain Bears glimpse into a parallel universe? I'm pretty sure it is. How this word also came to mean "chocolate, vanilla and strawberry ice cream altogether" is, of course, purely American. Three flavored desserts like spumoni became popular in the good ol' U S of A back in the 1800's, and since those three flavors just so happened to be also the 'merican tastes of choice, well, it became nearly synonymous. So, a little confusing, and of arguably two origins? 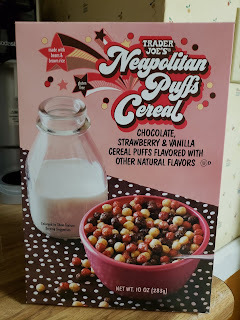 Sounds about right for the new Trader Joe's Neapolitan Puffs Cereal. Let me explain. First - this is supposed to be fun cereal, right? It's three flavors of puffs! 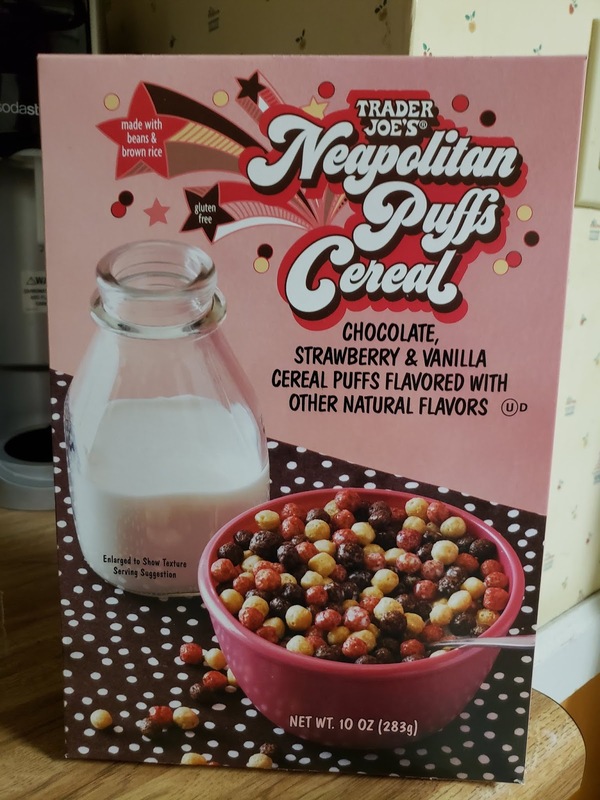 Words fall short of how excited my girls were to see the box when this definitely looked like more like a treat than an actual breakfast to them, bless their hearts. And it is fun. Out of the three, only really the vanilla kinda falls flat flavorwise, which is to be expected. High quality vanilla taste isn't really expected to be conveyed well via breakfast cereal. The chocolate and strawberry, though somewhat muted, still come across pretty well in a not-too-super-sugary kinda way. So we could identify this is as a junk or special treat cereal, maybe kinda like Cocoa Puffs or Lucky Charms. 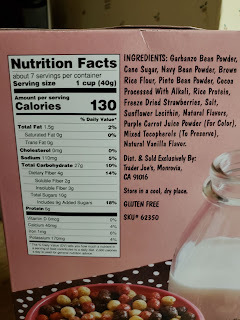 But then - look at the ingredients! Beans and rice! No corn! 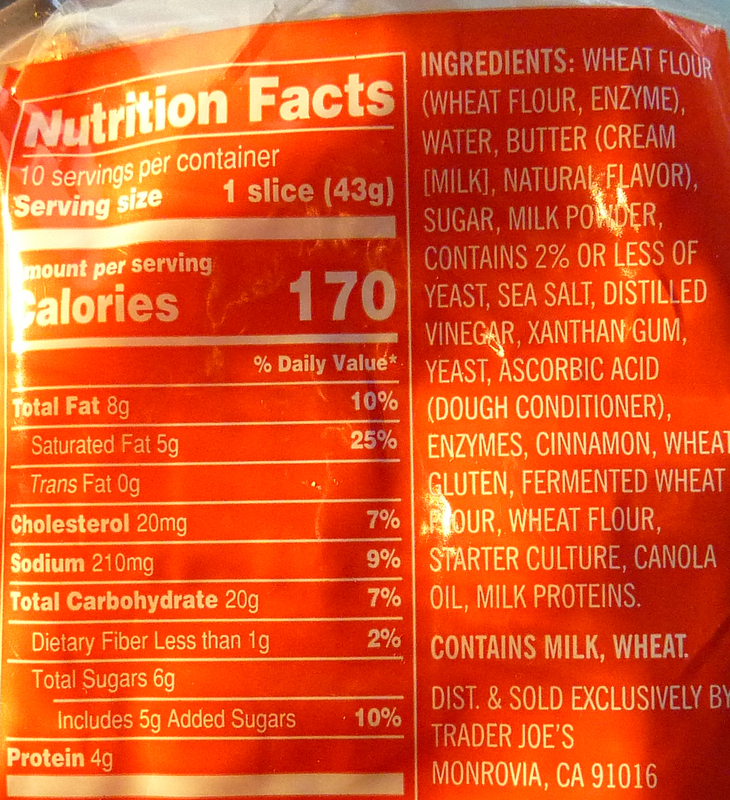 No wheat! None of those regular ol' breakfast grains. Rice isn't that odd - Rice Chex and Rice Krispies, amirite? - but beans? For breakfast? Odd, weird. It gives the cereal a kinda a healthyish vibe - I mean, look at all that fiber! And naturally then this is also gluten-free which is a plus. 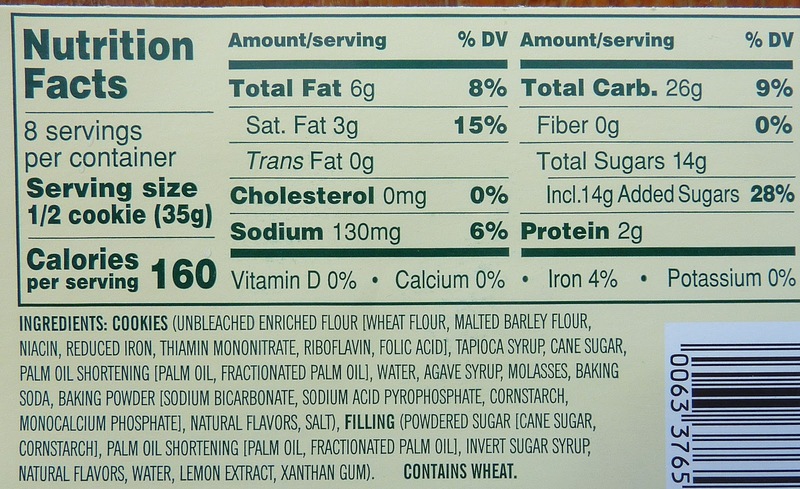 So could this be a healthy cereal? Two origins, and kinda confusing. I'm kinda stuck on that beans thing. No matter. This is a good, munchy cereal. There's a slightly shiny shellacky coating that seems to really help the neapolitan puffs maintain a good crunch even after sitting around in milk for quite a while. That's a big plus. Plus, all that fiber - usually, I avoid breakfast cereal in the morning as I feel that somehow it only makes me hungrier. Not here - a bowl kept me reasonably filled til lunch! Plus, as an added bonus, the pinkish/brownish milk it leaves behind is pretty decent. 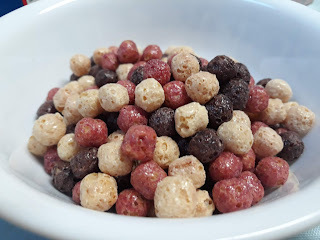 My kids loved having "chocolate milk" in their cereal. Again, bless their hearts. I don't do cereal often, and I'm not sure I'd really go for these tri-flavored puffs over and over again, but they do make a nice little pick up. For a gluten-free fun cereal, why not? The box runs $3.99 which is a little high on the TJ's scale, so there's another slight knock. If it were up to our kids, these would be a surefire pantheon pick, but to us more reasonable adults, some matching threes will do. Some of you who've been shopping at Trader Joe's for a while probably remember when they went nuts with a particular commodity and released a bunch of similar products all at once. I'm thinking of Coffeepalooza and Mango Mania in particular. There were a couple years there when they released an unhealthy amount of new cookie butter products, although they spaced out those releases a little better than the other two incidents I just mentioned. And of course, fall after fall, we were inundated with pumpkin spice offerings, although that seems to be tapering off, as TJ's is now balancing PS with apple, butternut squash, and maple offerings a little better than they did in previous years. But Sonia and I have always wondered why they haven't done "Ludicrous Lemon" or "Lemon Lunacy." They have plenty of lemon products, including lots of cookies, bars, tarts, pies, and beverages. Lemon Lunacy could include the re-release of Trader Joe's Lemon Triple Ginger Snap Ice Cream. And that would not only make the WGATJ's team very happy, but it would please every connoisseur of fine ice creams in the country. 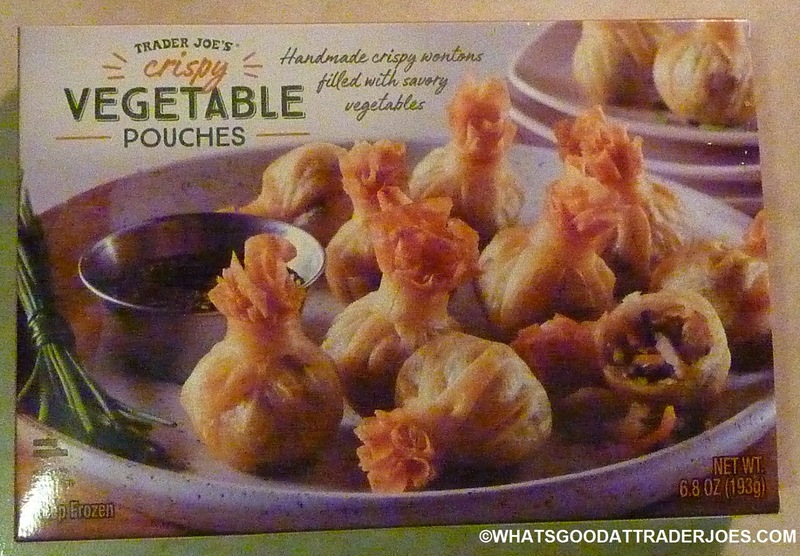 Why do you hate your loyal customers so much, Trader Joe's? These cookies would make a fine addition to Lemon Lunacy. They're lemony and sweet, and they're pretty satisfying. 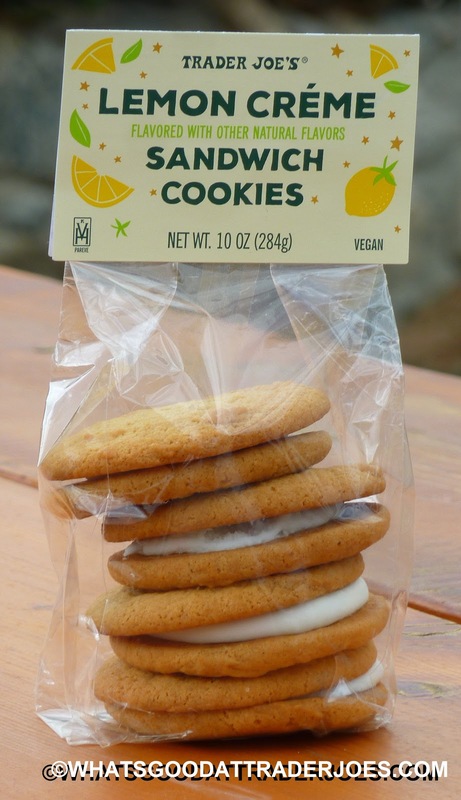 Flavor-wise, they're basically sugar cookies with moderate lemon flavor. They didn't go crazy with lemon here. I wouldn't have minded just a tad more lemonosity. 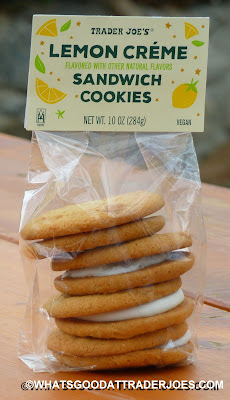 Both the cookie elements and the filling are lemontastic, but not to the point where tartness even has a chance to overpower the product's dessertiness. They taste fresh, pleasant, and enjoyable. However, in the texture department, our cookies were a little too stiff. I expected them to be soft. And they are...er, sort of. 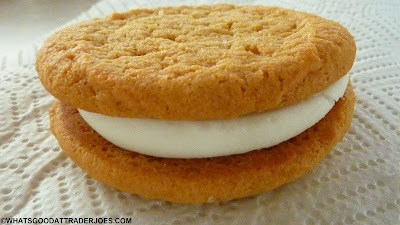 I figured they might be soft like Little Debbie Oatmeal Creme Pies are soft. They're not. They're simply not crispy or crunchy. They're chewy...but, I mean, they're a little too chewy in my book. I wanted them to be supple and malleable. But...I dunno. "Stiff" is the only word I can think of to describe the texture. Ours weren't stale. They weren't more than a couple days old when we opened the package. Perhaps somehow their vegan-ness makes them stiffer than cookies that can use butter and/or eggs...? At $4.29 for four cookies, these aren't super cheap, either. 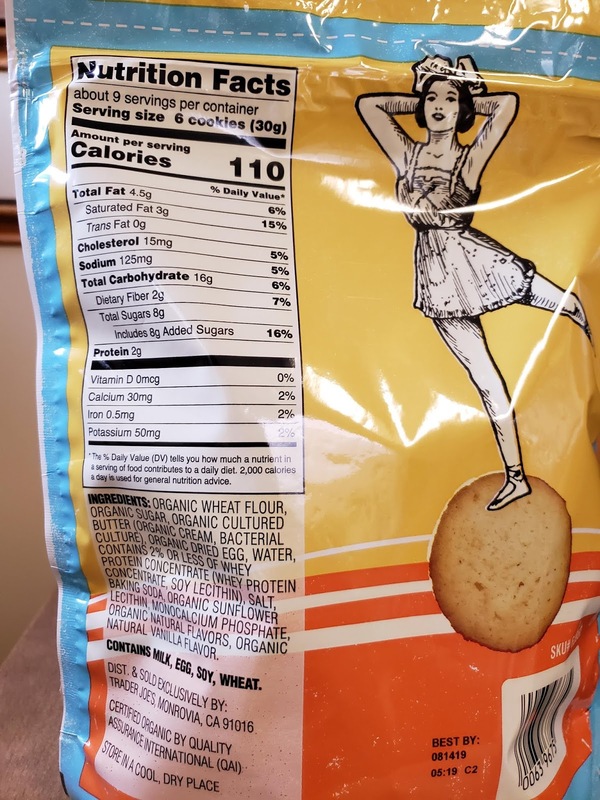 But at least there are eight servings in the bag. Wait. What? Yeah. You do the math. Worth a purchase for vegans and lemon fans, but there are better lemon dessert options in the store. 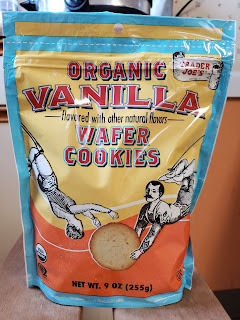 Again, flavor-wise, these cookies are sublime, but because of the stiff texture and overall value, I don't think these will be a repeat purchase for us. "WHY DOESN'T TRADER JOE'S SELL BANANA CREAM PUDDING!?!?!?!?!" I've wondered from time to time why TJ's doesn't sell particular items - I mean, they could have a whole line of baby food, name it Trader Joey's, put a baby kangaroo on it, and call it a day while making a killing - but banana cream pudding isn't one of those things whose absense I ever questioned. It's just not at TJ's. It doesn't need to be. Not that it wouldn't be welcome - I'm sure TJ's could acquire and distribute a pretty darn good banana cream pudding. 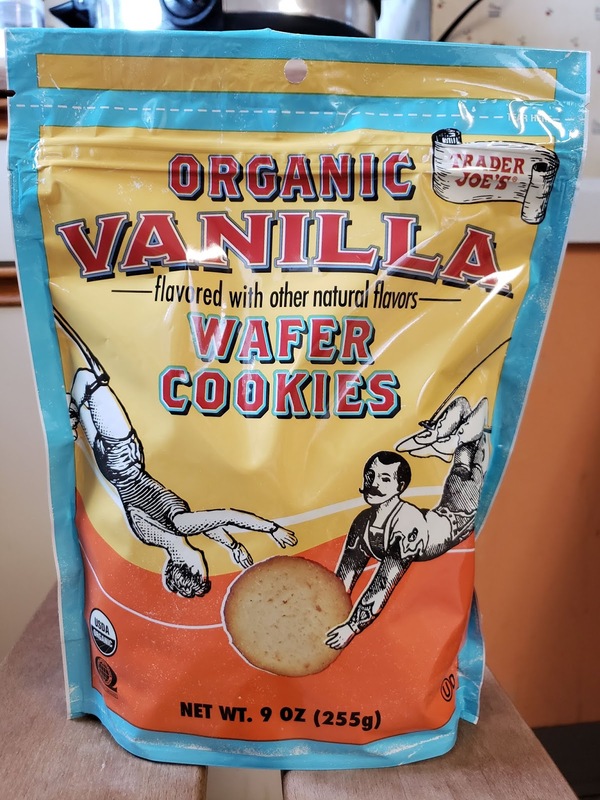 But it never crossed my mind that it was something that the brand lacked, and as far as I know, not my wife Sandy's either, until the introduction of the new Trader Joe's Organic Vanilla Wafer Cookies. The blatantly obvious comparison to these cookies is the famous Nilla Wafers. Those are all time classics - a bit plain, yes, but everyone knows what a nilla wafer tastes like. And apparently Sandy's favorite way to enjoy those ubiquitously famous cookies is with banana cream pudding, hence her outburst of sorts. I'll admit it, these TJ's wafers are pretty decent. One noteworthy facet of the appeal is the undeniable textural feel - they're incredibly soft and crumbly. There were very few full cookies that survived fully intact from factory to my kitchen. That's not a bad thing - the fact the cookies practically melt in your mouth is a major plus. Love 'em for that. But still, there's something a little off here flavorwise. It's not the vanilla - it comes off strong and sugary upfront and is thoroughly enjoyable. But a few chews reveal a certain....I don't know what. For lack of better theory, I think it tastes a little eggy. Too eggy. And sure enough, the ingredients list "dry egg powder" which seems a little strange to me. I'm willing to be wrong here, but that's what I'll point to as the main culprit for my slight displeasure. Dry egg powder....*shakes fist*. Regardless, we as a family enjoyed the cookies. Out of the box, they're good enough as is, but even better is paired with a little frosting or Nutella or jam. And, yeah, probably, banana cream pudding. Sandy raved about the wafers, noting their crumbliness. I like them enough to have a few but not enough to want to eat the whole box at once, so that's a plus. Couple bucks for the pouch and a few stars each in our books. What does hedgehog meat taste like? We know they're "organic," but were these hedgehogs raised free-range? Were they grass-fed? What part of the hedgehog was used in the making of these morsels? Ribs? Thighs? You'll not find the answers to these questions in the following review. But I will say that Trader Joe's neglected to list "hedgehog" in the ingredients. Perhaps, like Sonic, they were too fast to catch, and were thus pardoned from becoming ingredients in their namesake cookies. Man, was I was a Sonic the Hedgehog junkie back in the day. And I knew a girl with a hedgehog for a pet in college. Funny little animals. They eat mealworms and take dust baths. 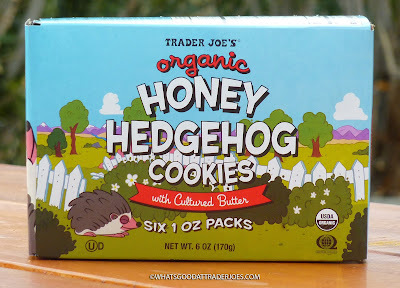 If goldfish, bears, and cats can have snacks named after them, why not hedgehogs? Even lacking hedgehog as an ingredient, as they stand, these vegetarian (not vegan) little crunchy cookies are still quite edible. There's plenty of honey flavor, and the "cultured butter" adds a nice little tangy zip to the sweetness. They're not unlike Teddy Grahams or regular honey graham crackers, but there's just a slight bit more complexity in the flavors here. I like them. Sonia thinks they're like Barnum's Animals but with even higher quality. Texture-wise, they're crispy, crunchy, and buttery. Each pack contains just the right amount of cookies to curb an average case of the afternoon munchies, or they could make a great "dessert" for a lunch box meal in the middle of a work or school day. $2.99 for six 1 oz. baggies. There are about nine hedgehogs in each bag—the perfect serving size if you ask me. Also, these hedgehogs are cute, both on the packaging and the cookies themselves. The kids'll love 'em...both the four-year-old kind and the 40-year-old kind. Once again, Sonia and I will put up matching sets of four stars each on this product. It's been a while since it's been mentioned here...I get weird about packaging, and especially for condiments. Namely, I hate squeeze bottles. Hate. That potentially uncontrollable plopping purge. That variable farty sound. The way when they're empty they only exude scented air and not only product. Ugh. Jars and bottles are okay, and you'd think that'd cover most basics aside from individual packets (also not a huge fan, mostly cuz I either can't open them or rip them right in half)...but here comes, of all things, a pouch. With a spigot. Whaaaa? 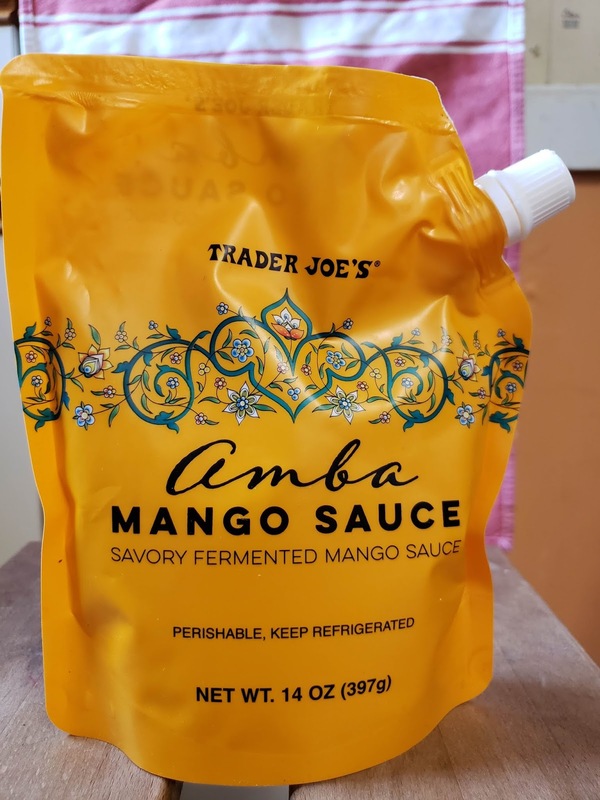 Such as it is with the new Trader Joe's Amba Mango Sauce. Why a pouch? I'm clueless here. Sandy said they're more refrigerator friendly than a jar or bottle. I'm not sure if I buy that. I see no reason for this to be in a pouch, and alone made me somewhat hesitant to try. Fermented mango stuff is cool, pouches with spigots, not so much. Man oh man, I'm glad I got over that. Imagine a mild, slightly sweet curry sauce, without any milk or anything for that little extra creaminess, and that's almost exactly what we got here. I wasn't sure if it was gonna be more jelly/jam/chunky/salsa like - nope, just smooth, smooth sauce that comes running out of that faucet faster than a tornado or a house falling down, as my four year old would say. There's some serious flow. Sandy and I poured some over some roasted chicken...and wow. It's unbelievable to me how mild it is. Mangoes can be strong and overpowering, and fermented stuff (which I love) can have that serious level of funk....but there's none of that here. 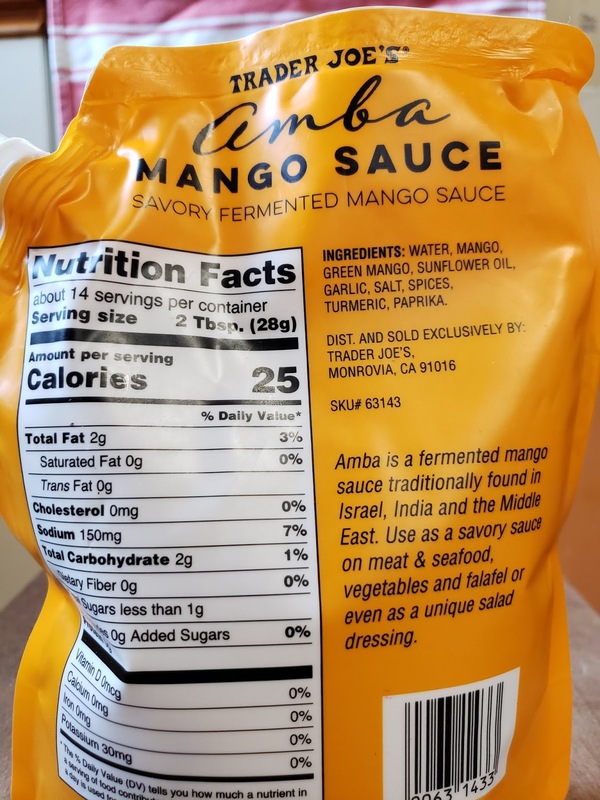 Although fairly simple and somewhat unassuming, the amba sauce has a certain balanced smidge of complexity between the faintly sweet mango and the spices, with the slightest bit of ferment as the backdrop. It's delicious. There's a part of me that wants a little more oomph, a little more bite, a little more spice, a little more something. But nah. The more I had, the more I appreciated it just as it is. It almost went better on our potatoes than our chicken, and man, I'd put this on almost anything. 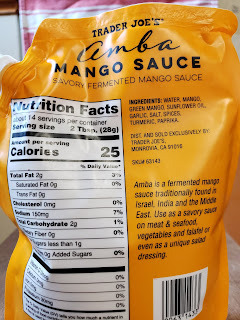 I've never had the privilege of trying authentic real amba sauce, so how good of a comparison this is to the "real stuff," you're gonna have to tell me. And also the price, too...Sandy picked it up but misplaced receipt. First one to hit me up with a price gets a shoutout here. EDIT: thanks to loyal reader rh383, it's $3.49! Not a bad price at all! I can see buying this again and again and again. Pork, roasted veggies, falafels...yes please. I can put down the hot sauce and sriracha for the amba any time. My kids don't like it, which is odd I think...oh well, more for Sandy and me. She ranks it as a perfect five, and well, it's been long enough since we've placed something on the Pantheon, so I'll go a little higher than I would (seriously, the pouch and spigot thing bug me way more than it should) to ensure the amba's place among the all time greats. 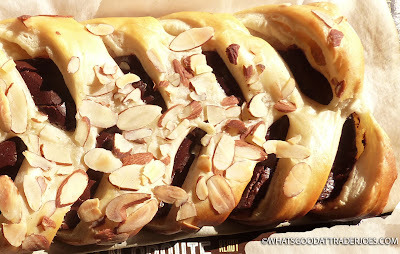 Call me jaded, but when I see "Chocolat En Croute," I assume it's just a gimmick. Crusty chocolate, eh? You expect us to pay $6.49 for a loaf of crusty chocolate, TJ's? I was wholly disinterested. Fortunately, Sonia didn't see it that way, and she picked one up before we left the San Antonio area. We needed backup review items for our long journey across western Texas and southern New Mexico. There aren't any Trader Joe's between San Antonio, TX and Tucson, AZ along the I-10 corridor. That's almost 900 miles and 13 hours of driving without a TJ's. We could have taken a detour up to Albuquerque and made a TJ's run there, but that's six hours round trip off our plotted course. So we just stocked up and headed west. So that means this box has been sliding around our little Norcold RV freezer for over a thousand miles. It was noticeably banged up, but still mostly intact. I photoshopped the worst parts of the package. Did anybody notice? "So why review this product now?" you wonder. Well, Valentine's Day (VD) is right around the corner, and this is among the items that Trader Joe's is promoting as a VD treat. Now that I've tried it, not only will I not argue with that assertion, I'll wholeheartedly plug this dessert as an ideal gift for your sweetheart. If your significant other is a chocolate person, but you don't want to go that same old, tired "box of chocolates" route, this is a great alternative. It's bursting with rich dark-ish chocolate taste, but it's also got flaky, buttery crust, almonds, and a delicious, creamy frangipane—reminiscent of amaretto. I don't often read the individual product write-ups on traderjoes.com because they tend to influence my opinions and scores, but I love the description of this dessert on Trader Joe's own website—particularly the line that calls it a "gorgeous, Paris-pâtisserie-worthy pastry." Couldn't have said it better myself. It's a top-shelf quality product that's almondy, chocolatey, creamy, and bready. I'd buy it again for VD or any special occasion—or just dessert on an ordinary day. Pleasant surprise with this one. Put us down for four stars a piece. Brie, turkey, and now chocolate. What will TJ's stick in a pastry crust next? Mango? Cookie butter? Coffee? Your guess is as good as mine.